Here is what can happen when we feel desperate about our situation. We tend to take matters into our own hands instead of trusting God and creating a godly response. When we act out of fear or intimidation or anxiety or worry or threats, we complicate the situation we had hoped to resolve, and suffer consequences we never anticipated or could have foreseen. VERSE 1 Nob stood one and one-half miles northeast of Jerusalem and two and one-half miles southeast of Gibeah. There Ahimelech served as high priest. Priestly activity, and evidently the tabernacle, was now there. It is significant that David’s first place of refuge was among God’s chosen representatives on earth. He wanted to get help from the Lord through them as he had done in the past. Apparently Ahimelech was trembling because David was alone. Had Saul sent him to harm the priests, or was David in some kind of trouble? Bear in mind that David was Saul’s general, and as such he usually traveled with escorting soldiers. VERSE 2 1st Question: David appears to have lied to Ahimelech v 2. He wanted Ahimelech to think that Saul had sent him. This was deception at best and a lie at worst rooted ultimately in need for self-preservation and lack of faith in God. David made some mistakes in his early years as a fugitive. He handled himself better as time passed. During this time God was training him for future service. David proceeded to explain that the reason he was alone was that he had sent his soldiers elsewhere. He intended to rendezvous with them shortly and had come to Nob himself to obtain provisions, protection, and prayer. How does it look to Ahimelech? Here is the leader of the armies of Saul, and he is alone. It is a Sabbath. The "Law" forbids travel on the Sabbath. David never traveled alone. He traveled with an army, or at least a band of bodyguards. Ahimelech, knowing the kind of conflict going on 5 miles north, is sure to wonder what is happening. VERSE 3-5 David asked for the showbread that the priests ate (Ex 25:30; Lev 24:5-9) v 3. This was the bread that for a week lay on the table of showbread in the tabernacle. Each Sabbath the priests replaced this bread with fresh loaves. The 12 loaves indicated God was the total provider for all the needs of Israel. God would surely supply for David, if only David had connected the dots at this sacred moment. Ahimelech was careful that David’s men were ritually clean, not having had sexual relations with women that day v 4. David assured him that their bodies were clean ritually v 5. This made it permissible for them to eat the consecrated bread. VERSE 6 Ahimelech gave David the provisions he needed v 6. Jesus said this was proper for David to have done Mt 12:1-4. God designed the Sabbath for man's benefit, not demanding man to conform to the Sabbath The reason was that human life takes precedence over ceremonial law with God. David was probably not at the point of starvation. Certainly the Lord’s disciples were not. Nevertheless human need should always be a higher priority than the observance of a ritual used to worship God. VERSE 7 The mention of Doeg, an Edomite, a ruthless opportunist who had risen high in Saul’s government v 7, prepares the reader for his informing Saul about what happened at Nob in chp 22. David knows Doeg will go back and tell Saul. What desperate position had David put Ahimelech? Remember Saul? David’s intrigue will have repercussions for Ahimelech. He will die. VERSE 8 2ND Question: David now asked for protection, namely, a sword v 8. Goliath’s huge sword, which had initially rested in David’s tent, was now in the tabernacle wrapped in the priest’s ephod. David knew it was there. He needed a weapon and that is why he came to Nob. VERSE 9 David eagerly accepted it from Ahimelech since there was no sword like it. Solomon used the same expression to describe the Lord (2 Sam 7:22). Though there was no better protection than Goliath’s sword physically, the Lord was an even better protector spiritually. There is none like Him. 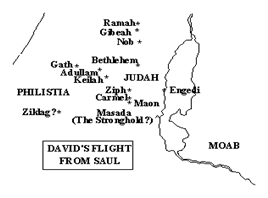 (1) David knew Saul was going to hunt him down (20:3, 30-31). (2) David needs provisions both food and any weapons he can secure. Remember the Philistines had controlled Israel’s weapons so there was neither spear nor sword available (13:19-22). (3) It is a desperate time for David and he is attempting to find a way, maybe any way, to survive. However, desperately taking matters into his own hands, he compromises himself with intrigue which will get him in trouble and come back to haunt him. Lesson: A believer never needs to act desperately. Find a way, yes. Take some action, of course. Create a godly response of some kind, absolutely. Trust God with that response, essential. What you can’t do is grasp any desperate measure possible. David will become more seasoned, but unfortunately this will become a fatal flaw throughout his personal life and reign. We see it with the sin of Bathsheba and ensuing cover-up. We see it when he counts his forces. We see it when he flees the palace because of Absalom attempted coup. Desperate solutions become gateways for frequent resolution. VERSE 9-11 David’s gotten out of dodge and this next refuge proved to be just as insecure v 9. It is a mystery why he sought refuge with Goliath’s sword in that giant’s hometown v 10. Perhaps he went there since Achish was an enemy of Saul’s, as David was. The people identified David at once and called him Israel’s king v 11. David’s reputation had spread. In any case Achish’s advisers viewed David’s presence as a threat. The potential of his helpfulness against the enemy had to be weighed against the chance that he would prove disloyal, turn on his host, and do much damage. VERSE 12-13 David sensed his personal danger due his reputation getting into the ears of the commander so desperate he concocts pretending to be insane to save his life v 12. Evidently Achish dismissed him concluding that David was mad and could be of no help to him against Saul v 13. If you read Daniel, chapter 4, you know that is exactly what God did to Nebuchadnezzar. He was boasting about Babylon he had built when God struck him with madness, fulfilling a prophecy of Daniel's. Nebuchadnezzar became like an animal. He wandered about eating grass, with fingernails like claws and hair like fur, and no one killed him. The same with the demoniac at the edge of town in Jesus day. VERSE 14-15 So Achish sent David away. Psalm 34 is when David flees to the cave in Adullum where God apparently straightens out David's thinking according to the Psalm. Psalms express David's deep trust in and commitment to his God. Yet there is also this strange feeling of undeserved persecution. He struggles between deep trust in God and a feeling of unfair persecution. God is taking him through this wilderness experience to teach him absolute faith. This is one of the places that he learns it. 1. In both Nob and Gath David resorted to deception to protect himself, and in each place some bad consequences resulted. This brings back memories of Abraham, and Jacob who deceived to protect themselves. Doeg killed the priests, and David had to abandon Gath. 2. However, David also trusted in the Lord. He wrote Psa 34 and 56 during and after his time in Gath, according to the titles of those psalms. They reveal that he was trusting God. His ultimate hope for provision and protection was not the priests or Saul’s enemies but the Lord Himself. 3. This faith undoubtedly explains the fact that God preserved him, and some good consequences came out of these experiences. David had two more encounters with Achish both of which were beneficial for David. 1 Sam 21 helps us see the mixture of right and wrong in David’s actions, but David’s psalms clarify the proper response that the godly should make when opposition assails them. Lets read Psalm 34 now. Could there be echoes of 1 Samuel 21 here?